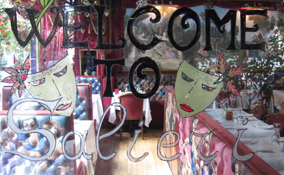 Salieri is an fun restaurant on The Strand that serves up delicious Mediterranean style lunch and dinner. It is famous for its ecelctic interior decor that ranges from theatrical scenes plainted on the leather bench seating to all manner of stage props hanging on the walls and ceilings. "What a great place to represent on a website!" It was also a good opportunity to have a thorough look around the restaurant, sample the food and take many photos of the inside and outside for use on the site. We provided Salieri with a website that makes the user get a true feel of the restaurant's style, displays an offering of the food in the form of a dynamic carousel of food photos and incorporates an online booking form.